Use this function to trim or break a solid body using curves. Note that breaking the solid will create new bodies for each trimmed portion. Note that if the solid being trimmed contains multiple lumps, only those lumps that intersect the trimming entity are trimmed. Any lump that is not intersected by the trimming entities remain in the trimmed solid. This may cause the solid to appear visually disjointed in space.. 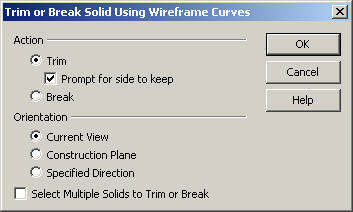 The Trim or Break Solid Using Wireframe Curves dialog appears when this feature is selected. The options under Action allow you to specify whether to Trim or Break the selected solid, and prompt for the side to keep. Trim - When selected, the solid will be trimmed to the indicated curve. Break - When selected, the solid will be broken using the indicated curve. Breaking a solid will create new bodies for each trimmed portion. Prompt for side to keep - Enable the Prompt for side to keep checkbox if you wish to cursor select the side to keep when trimming. If this option is not checked, the side to keep is automatically determined by using the cursor pickpoint on the body, and comparing normal vector directions to the trimming faces. This algorithm may fail in certain situations and hence the option to be prompted for the side to keep. When this option is checked, two opposing normal vectors are displayed, and the side pointed at by the selected vector will be kept. Choose ACCEPT or [Enter] to complete the trim. Break - When selected, the selected body will be split, and not trimmed as is the default result. The options under Orientation are used to determine how the curves will be projected onto the solid. Current view - When selected, the curves will be projected along the z-axis of the current view straight into the screen. Construction Plane - When selected, the current construction plane is used to control the projection. Specified Direction - Specify the projection direction using: 2 points; an existing line; an existing vector; etc. Select multiple solids to trim or break - When selected, this option allows you to select multiple solids/sheets to trim. Once you click OK, you are prompted for the trimming entity/entities. The next step is to select one or more solids/sheets to trim. When cleared (default), after you click OK, you are prompted for the trimming entities. The next step allows you to select one solid/sheet to trim/break. Once the operation is complete, you are prompted to select another solid/sheet to trim. If you are done trimming, selecting the ESC key exits the function. <p class="Body-Text-Indent> As it suggests when checked you will be prompted for multiple solids to modify, choosing Accept when all have been picked and then getting the vector direction arrows. The required steps might change depending upon what settings are chosen in the dialog box for the function. Select Curve from the Modify>Solid Trim/Break submenu. The Trim or Break Solid Using Wireframe Curves dialog box appears, from which you are able to specify whether to trim or break the solid, as well as the orientation at which to carry out the selected operation. Once this dialog has been configured, select OK. Select the solid body to be trimmed. The solid will then be trimmed, or broken, per the specifications made in the dialog box.